Danny's Grandmother, Christina Leahy, nee Grogan, was a famous concertina player from Kilrush, Co. Clare. At one time in her house, there were 12 concertinas. Christina's son, Dan Joe Leahy, also played the accordion. Danny draws from this rich musical heritage, spanning over a hundred years, in his present musical endeavours. Danny has played for a number of Pipe Bands over the years in competition and has an All Ireland Medal for playing with St. John's Pipe Band in Tralee. 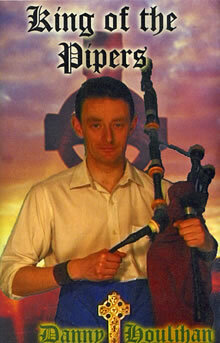 He has instructed for the Irish College of Piping and has certificates in Grades 1-4. He is also the holder of the Royal Scottish Pipe Band Association Certificate for elementary piping. Danny Houlihan is a native of Ballybunion, Co. Kerry. He learned to play the bag pipes from the famous piper Jimmy Fitzgerald of Main Street, Ballybunion. His Uncle Danny was a piper in the first 'Dr. Hannon Memorial Pipe Band'. Danny learned to read and write music from Jimmy Fitzgerald and in the late 1980's took over as Pipe Major of this Pipe Band. He is noted for winning 8 All Ireland Medals with Fleadh Ceoil Na hEireann and for recording the first contemporary piping album in Ireland, called 'King of the Pipers'. His second album which he recorded himself in 2003 is called 'Cosmic Flow'. At the moment he is working on his third album which he hopes will be launched in 2007. Danny's music incorporates and fuses the old traditional style of piping with a contemporary modern feel. This is quite unique in Ireland as Danny uses both Uilleann Pipe and War Pipe techniques. His style of piping is based on the Co. Clare/Co. Limerick/Co. Kerry piping genre. He is currently constructing his own custom built recording studio to produce and keep the tradition of Irish music to the forefront of world music. He also perpetuates the memory of 'Carthy The Piper' who lived in Ballybunion from 1799 - 1904.